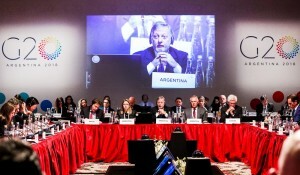 Energy ministers from the world’s 20 biggest economies met in Argentina last week releasing a communique on Friday that was intended to sum up the group’s commitment to the “role of energy in promoting fair and sustainable development”. But the meetings and resulting statement were overshadowed by two fundamental compromises: on the one hand, while the Trump Administration rejected the Paris Agreement, other G20 energy ministers stood strong and reiterated their commitment to climate action. Yet on the other hand, G20 energy ministers contradicted themselves by cheerleading the expansion of fossil gas production and consumption, despite clear evidence that Paris goals cannot be met if we expand fossil fuel infrastructure. The statement on fossil gas focuses on the “potential to expand significantly over the coming decades.” While this sounds like pro-fossil fuel propaganda from team Trump, it unfortunately reflects an agenda that is shared among many G20 countries, although equally misguided. It repeats the myth that gas supports “transitions towards lower emission energy systems” and expresses support for expanded gas markets and LNG and gas storage infrastructure; G20 energy ministers said all of this despite clear evidence that the production and consumption of gas must decline and that growing gas production is slowing not supporting the transition to clean energy. Oil Change International, together with 20 global organizations, released a report ahead of the energy ministers meeting last week highlighting the compromising position of many G20 countries on fossil gas in light of their stated commitment to the Paris climate goals. The report, called “Debunked: the G20 Clean Gas Myth” reveals that many G20 countries are planning a massive expansion of fossil gas production, so much that G20 gas production alone could wipe away two-thirds of the carbon budget for 1.5 degrees by 2050. By 2030, G20 countries are projected to host investment of over USD 1.6 trillion in new gas projects. If this happens, emissions from fossil gas produced by G20 countries through 2050 would consume nearly two-thirds of a carbon budget that offers a 50 percent chance of limiting global warming to below 1.5 degrees Celsius. This would make it extremely difficult to meet the goals of the Paris Agreement, which has been signed by all G20 members. Five countries – the United States, Russia, Australia, China, and Canada – are projected to host 75 percent of capital expenditures in gas production in G20 countries from 2018 to 2030. The United States, Russia, and Australia alone comprise nearly 60 percent of total G20 projected capital expenditures in gas production. Argentina’s push to open massive shale gas deposits to investment risks undermining its commitment to the Paris Agreement and the work of the Energy Transitions Working Group during its G20 Presidency. If exploited to its fullest extent, Argentina’s shale gas could consume as much as 15 percent of the remaining carbon budget that offers a 50 percent chance of limiting warming to below 1.5 degrees Celsius. Climate goals require the power sector to be decarbonized by mid-century. This means fossil gas use must be phased out, not increased. Wind and solar are now cheaper than coal and fossil gas in many regions. This means new fossil gas capacity often displaces new wind and solar rather than old coal. Claims that fossil gas supports renewable energy development are false. The cheapest fossil gas generation technology, Combined Cycle Gas Turbine, is designed for baseload operation, not intermittent peaking. Regardless, most grids are far from renewable energy penetration levels that would require back up. Storage and demand response technologies will be ready to step in by the time they are required. Companies building multibillion-dollar fossil gas infrastructure today expect to operate these assets for 30 years or more. Emissions goals mean this expectation cannot be met. The coal, oil, and fossil gas in currently producing and under-construction projects are enough to exceed climate goals. Opening new fossil gas fields is inconsistent with the Paris goals. Given these facts, the nineteen G20 members that are committed to the Paris Agreement are compromised not only by the belligerence of the current U.S. administration’s brazen pro-fossil fuel agenda, but also by the many member nations who have put the continued exploitation of their gas reserves ahead of sound climate policy. There is an urgent need for policymakers to use climate goals as a starting point for decisions around fossil gas, in the G20 process and elsewhere. Rather than searching for ways to justify using the abundant supply that new drilling methods have unleashed, policymakers should consider how much fossil gas is compatible with achieving the goals of the Paris Agreement. The answer is the same for fossil gas as it is for coal and oil: We need less, not more.